You must make reservations at least 5 minutes in advance of the time at Schnitzel & Co..
Wilkomen to Schnitzel & Co.! 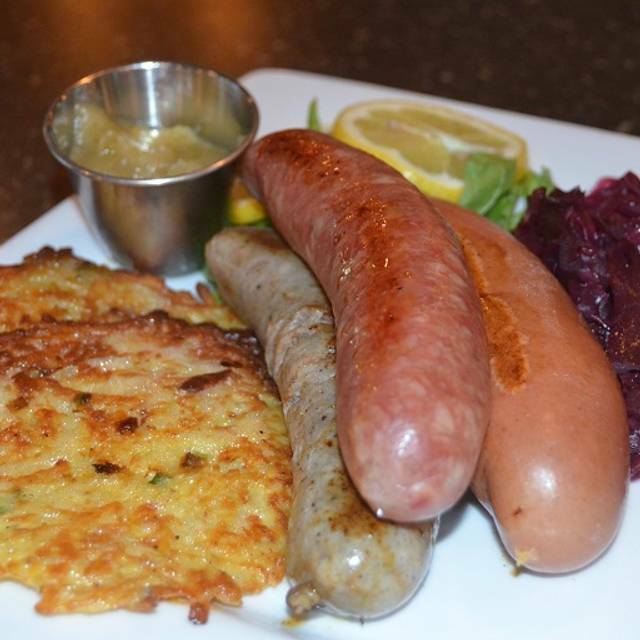 We invite you to stop in and enjoy our authentic Swiss German cuisine! Open Monday through Friday at 1130 am for lunch; Saturday and Sunday at 1030am for brunch. Guests can enjoy traditional Swiss-German menu items such as weiner, jaeger, chicken and perch schnitzel, a variety of sausages, glazed pork chop, as well as homemade rye and pumpernickel. Soft pretzels are made daily and served with a creamy beer and cheese dipping sauce as well as a trio of homemade mustards. The mouth-watering selection of authentic side dishes such as potato pancakes, spaetzle and sweet & sour red cabbage along with sweet potato pancakes, homemade slaw and caramelized brussel sprouts; allow guests to customize their meal. 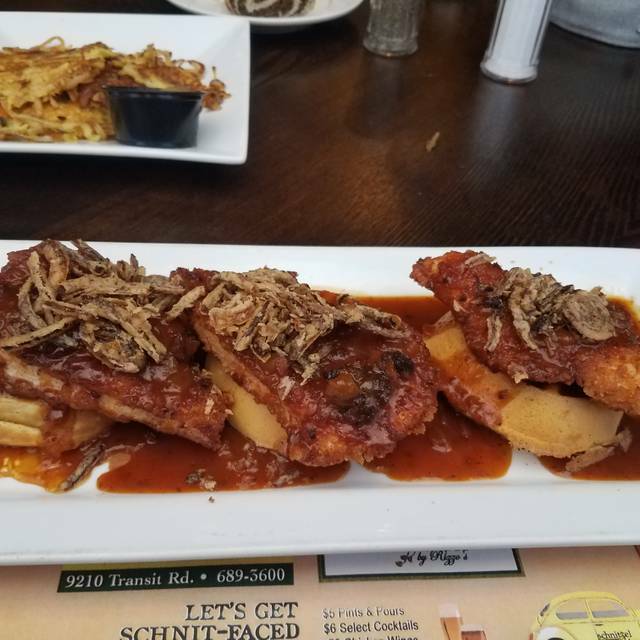 Schnitzel’s beer menu offers a vast selection of draft, craft and of course German beers-- from Spaten to Franziskanner and everything in between! There is even birch beer on tap. Be sure to stop in and see us! greens, apples, craisins, goat cheese, walnuts & raspberry vin. Great menu and service! Our waiter was funny and efficient! Great Restaurant Week choice ! Unbelievable homemade German food. No point in mentioning specific dishes because there were 4 of us and every single thing we had was absolutely delicious! Table ready on time. Order accurate. Food very good. No complaints! Menu on website differs from what is actually in restaurant. Ribs were tough and rubbery, walnut salad was absent any nuts whatsoever?,schnitzel not very tender and the few fries were not appetizing. However, the wurst was quite good and slightly undercooked but easily the best item at our table. I would recommend this place to groups where beer and camaraderie were more important than the food. 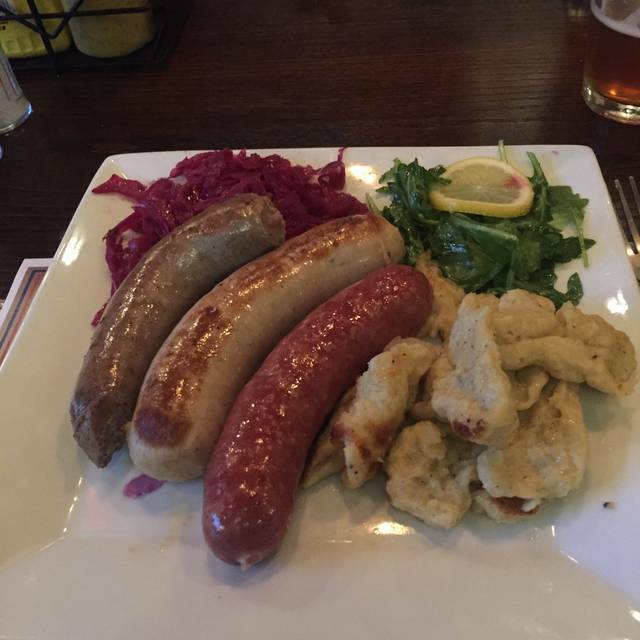 We were looking for a place that served German food and your restaurant came up as a potential candidate (celebrating my daughters boyfriend birthday who embraces his German heritage). After further research, we decided to go out to dinner at you establishment. We found the staff friendly, the food well prepared and presented besides being simply delicious. All 4 of us came away impressed with what we ate. While hoping for a bit more of a German atmosphere, the interior was relaxing and comfortable. The only negative (if you can call it that) was the waiter disappeared at times when we could have used him (to take our food order, for a drink refill, bring us the check) He did allude at the beginning that he was new so I guess we could forgive him for the slight delays. We will definitely recommend your establishment to others and return ourselves in the future. Great food and service. First time there. Will definitely be going back. For a good review I will have to make several return visits, but rest assured I will be heading back. The only negative was finding out the beer braised ribs on the gluten-free menu were not made with gluten-free beer ( they do offer gluten-free beer in the beer section of their menu). I would suggest taking that menu item off of the gluten-free menu as that dish is not gluten-free if made with regular beer. You could make the dish using gluten-free beer and it would be ok. FYI. My husband is Hungarian and loved his meal. Best food in the area. And our service was great! Service was good...friendly and welcoming. The food was OK. However, I would not order what I had a second time. We went to Schnitzel for my husbands birthday and had a great time-the staff was wonderful! Thank you for good food and great service! Food & service was VERY GOOD. Unfortunately, the table next to us was extremely loud & we could hardly hear each other at our table. Food was good. Everyone enjoyed their meal. Service was efficient and accommodating of our request for separate checks. Reservation was set up as requested. Meal was leisurely but NOT slow. The food was great, service was good. Bar was quite boring. Unfortunately we were disappointed with our visit. The service was very friendly and attentive but the food was not good and worst of all, not hot. I would recommend this restaurant, great food and love the German beer . Friendly staff that made the night very enjoyable. If you ever had a real wiener and tasted proper Swiss/German/Austrian food please don’t go there. Sadly a nice try but maybe a trip to Europe for the chef would help. Call it “research”. We were looking for a place to celebrate with family and enjoy a good meal, and we found it! The food, and beer, were great, and reasonably priced. Service was cheerful and attentive, if a bit overworked. The kitchen was a bit slow, but we were in no hurry and enjoying ourselves. We were seated in a sort of alcove, so the noise of foot traffic and other diners didn't affect us too much. Food was great! We'll be back! This was our first time at the restaurant and were relatively satisfied with everything except the wine choice. We eat out quite often and my wife really enjoys a good glass of chardonnay. Other than a ordering a full bottle,the only glass choice was one Italian chardonnay which my wife did not like at all. For a restaurant like this, it should have more variety at least a Kendell Jackson which most white wine drinkers like! Service and atmosphere were great. We asked for a different table because we dont like lights in our face - gives me migraines. Food was okay. We felt like maybe we didnt order the best thing on the menu. Veal was thin and dry. Potato pancakes were kind of dry and flavorless. We want to come back and order something different. Great food and good service. Loved the beer selection! Although not quite authentic German food, it was definitely worth it. Their pierogie (Polish plural) do need a little help, the latki (potato pancake) were good. Overall, their dishes could use a bit more flavor, but otherwise we had a great time. Definitely going back. Expert service and incredible menu with many options. Great German beer selections. Warm and gracious staff. This was a last minute decision to go out, I made reservations, although I requested a specific time and hi- table top seating, neither were granted; but that was okay. We didn't wait long, about 5 minutes past my requested time and got a standard table, the meal however was the important part and everything was delicious. I will definitely recommend Schnitzel & Co. on Transit Road, to friends and family and go back again myself. Love everything on the menu except the flatbreads. One of my absolute favorites! I use open table regularly, and this is the first time a restaurant acknowledged that the reservation was for a birthday. They came out singing with a brownie and ice cream. The service was quick and the food was good. Will definitely go back. Schnitzel the waitstaff was attentive and personable; and the food was outstanding. The pretzel is a MUST TRY! I went there to check out the menu, service, and banquet room options. I look forward to bringing my business meetings here. Very pleasant experience. Visited for local restaurant week. They were quite busy but service good and food were well prepared and very tasty. Our server was attentive and friendly. There are lots of other dishes we would like to try, we’ll be going back in the future. GREAT! Service was Outstanding! Food was Excellent! We will be back for sure! Shout out to Courtney, she was wonderful! The food was amazing. Service was ok.
Great authentic German Food! Beer selection is great also! The food was delicious. Our only complaint is that the strudel portion could be a little larger. First 3 visits were good. The last two have had issues. This time the cheese sauce was burnt and they had no other pot, my first weistwurst was underdone and the second was cold in the middle. Won't be coming back. Our server, Jan, was very friendly and accommodating. See Full Restaurant ListMake a Reservation at Schnitzel & Co.